Not quite a month ago, I mentioned that I was going to begin open sourcing the themes (and potentially plugins) that we sell on WordPress.com. Right now, this is only a single theme (though others are in development and I’ll talk more about that later). As of today, Mayer for WordPress.com along with the three (yep, the only three) outstanding issues for the next milestone are available on GitHub. The initial post was met with some great conversation via both the comments and tweets – some pushback, some not – but I’m excited to see where this goes and I do feel that this is the best decision, for now, with respect to this particular theme. Why Open Source a Premium Theme? The way I see it, though I know not everyone does, is that the theme itself is open source by default. How easy it is to access the source code is another story, but it falls under the GPL (or a compatible) license which means that the source code is able to be freely distributed. The advantage to this means that all of the work that the team and I have backlogged for this project (and for future projects) is publicly visible if for no other reason that for accountability. Ideally though, we’d be able to benefit from the open source community that comes in the forms of code reviews, pull requests, or just general conversations to help make the core product better. Anyway, if the code itself fall under an open source license, then I’m willing to make the code freely available. This does not mean that I’m willing to support the code base for those who haven’t paid, but that leads into an entirely different discussion. If you’re in the business of software and you take your core product offering and make it freely available, then I’d say you’re moving out of the software business and into the support business. I mean, how could you not be doing this? In order to turn a profit, people will need to purchase and/or subscribe to support in order to have their questions answered. This isn’t too far off from what people are doing already, right? I mean, sure, you can make a case that people are paying a price to access the source code, but they’re also paying a price to ask questions, get support, and – for some projects – get updates. What About Mayer For WordPress.org? As we begin to work and release future themes for WordPress, we’re hoping to creating a single version of the theme. Personally, I’m not a fan of having two versions of the same theme named the same thing with a different feature set. This means that when we release, say, The Acme Theme, then it’s going to be the same feature set that you’d get on both WordPress.com and on self-hosted installations. Any additional features that aren’t compatible with WordPress.com would be released and theme-specific plugins (or theme extensions, I guess you could call them). This is really getting ahead of ourselves, though, as right now we have a roadmap of a few themes planned first. 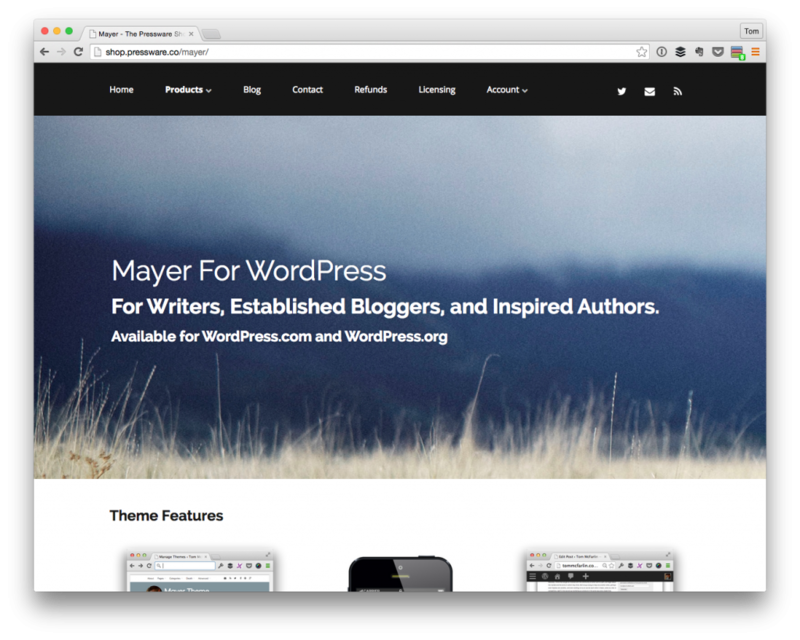 Anyway, Mayer for WordPress.org will still be available at The Pressware Shop, though that entire site is going to undergo a facelift at some point as we begin to make this shift in the way we’re serving our core offering. I know: Just because this model works for some people doesn’t mean that it’s going to work for other people. Pressware has largely always been a services-oriented business which I’ll talk a little bit more later in the article. This is the first foray into really taking a hard turn with products. And I think the rush to the bottom isn’t doing anything to help the WordPress economy. In short, if this doesn’t work, that’s fine. We’re in a place where we can always go back to selling themes as they’ve always been sold, but this is something we’re more than willing to try. So what does this mean in terms of grabbing your copy of Mayer? This means that you’re able to grab your copy of the latest version of the theme as well as track with the outstanding issues from the GitHub project page. Note that this version of the theme is currently the version that’s for sale on WordPress.com, has been for the past year, is up to version 1.9.0, and has undergone the usual code audit via the WordPress.com theme team prior to release. 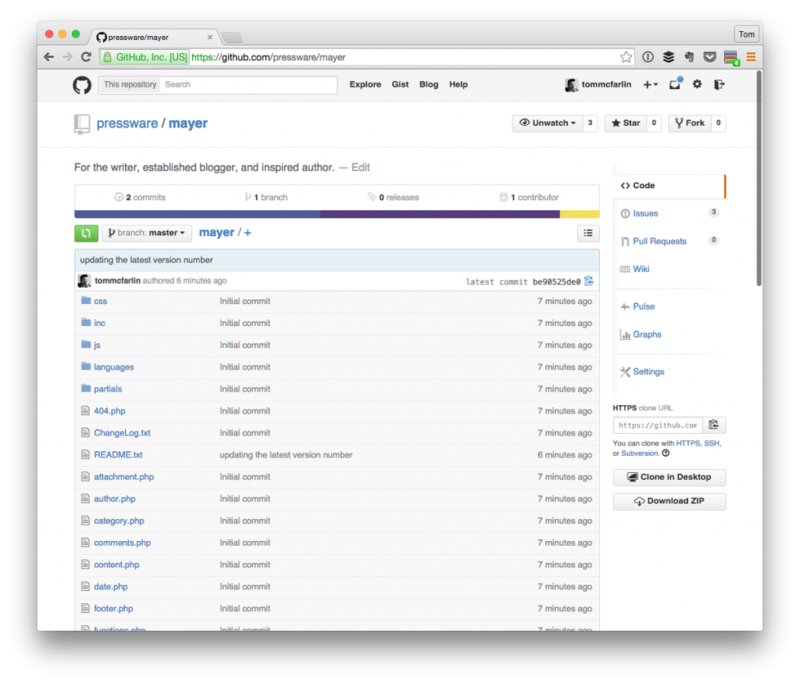 Right now, we’re going what we can to get the project into the world of truly open source software. Perhaps it’s an ignorant move not to offer a purchase page for support, but that’s a risk we’re willing to absorb right now if for no other reason than we believe Mayer is that easy to use out-of-the-box. If not, no big deal. We can setup a payment gateway for support and we’ll go from there. Being a small team trying new things is a very exciting and has very little friction to adding new features like this. And as we go about doing this, we’ll be sure to share what we’ve learned. This is really content for another post, but for the past several years, Pressware has largely been a services business. That is, we build custom solutions for other people based on WordPress and then support it as necessary. There’s a lot of [great] things to say about this model and I absolutely love it; however, as the business continues to grow (which is exciting in and of itself), we’d like to begin creating a products division, a products vertical, or whatever term you want to call it. I’ve never been one much for business speak. To that end, we’re likely going to be placing more of our work on GitHub and experimenting with this particular model. Again, though, this is content for another post. In the mean time, enjoy Mayer and we welcome any and all conversation in the posts (or on Twitter). This is really interesting Tom. back to your sales page. really only going to use an hour of your time each year? doing the work or you. Is that an accurate representation? Oh yes :). Learned a lot over the last year of so working on this theme. The next round of things we have coming will be a bit, oh what’s the word, …it’ll have some nicer typography :). Yeah, I was excited too but once I activated the theme… it looks a bit different than the version Tom is using currently on his blog. May I know why are you releasing old version Tom? Is it for the sake of compatibility and clean audit result from the wordpress theme reviewer? Feel free to shoot me an email or open a GitHub issue about this. The goal is to make sure that the “what you see in the demo” versus what you get when you activate the theme is as close to 1:1 as possible. If it’s not, then that’s a problem on my end and something I want to clarify. May I know why are you releasing old version Tom? Is it for the sake of compatibility and clean audit result from the wordpress theme reviewer? This shouldn’t be considered an old version. The only customization I’ve done to my implementation of the theme is to accommodate the advertisements on the sidebar. I’m all for continuing to improve this (which is another reason for open sourcing it :), so I’m all ears! My speculation is, Google web font has updated their ‘Source Sans Pro’ as used in your theme and mine. It appears to be thinner than usual, both in my firefox and chrome. Thanks for your clarification Tom, I’ll spend some time to learn more about your theme. This is correct. It’s actually more visible in the actual WordPress editor than it is on the front-end, in my opinion, especially if you’ve been using the theme for any given amount of time. Of course. And thanks for your comments. Please do feel free to go in touch with me with me either via email or GitHub issues and we can chat further! Well it is open source. . . . I always expect the unexpected from you, and here is one solid example of why. Hey Tom, I think this is awesome, and I totally agree with your motives for doing it. However, I’m just curious how well it will work. Selling people what you think they need (support) vs. selling them what they want to buy (a premium theme) is a problem in my mind. Justin Tadlock has been doing this for years with the Hybrid Theme, and I’m skeptical that it’s something sustainable. I would love for you to prove me wrong, I’ll look forward to future updates about how it’s going. However, I’m just curious how well it will work. I’m right there with you, Scott. Selling people what you think they need (support) vs. selling them what they want to buy (a premium theme) is a problem in my mind. I definitely think it’s something that has a high potential not to work, but it’s something that I’d like to at least try, you know? Justin Tadlock has been doing this for years with the Hybrid Theme, and I’m skeptical that it’s something sustainable. Definitely. The thing is, the transactional model isn’t sustainable either. The subscription model is, but I still think exploring the right pricing and unit of time (three months, six months, 12 months, etc) has yet to be determined. From my experience, 12 months is too long but there are people and shops who make it work so we’ll see. This is something that I’m definitely going to be talking about as time passes. This is no doubt a bold move, and I applaud you for trying it out in the name of many others within the community. Question: In what way do you think the transaction model is unsustainable? Question: In what way do you think the transaction model is unsustainable? Generally speaking, a one time payment for a lifetime of support just doesn’t scale well when you get thousands of customers. Ah yes, I fully agree with you on that. Interestingly enough many premium plugins I’ve come across have a fairly low renewal rate anyway. Previous PostPrevious Am I Giving To WordPress?